Written, Produced, Directed by Chris Mortensen – a television producer and documentary filmmaker whose many programs have appeared worldwide. In the U.S. his documentary subjects have ranged from Field Marshall Bernard Montgomery, Hermann Goering and John Paul Jones to American Gangsters, the HIV crisis and the Iraq War. From Professional Wrestling to Halle Berry to the Suez Canal, his programs have appeared on Discovery, A&E, History Channel, ESPN, Fox Sports, BET, TV One, et al. 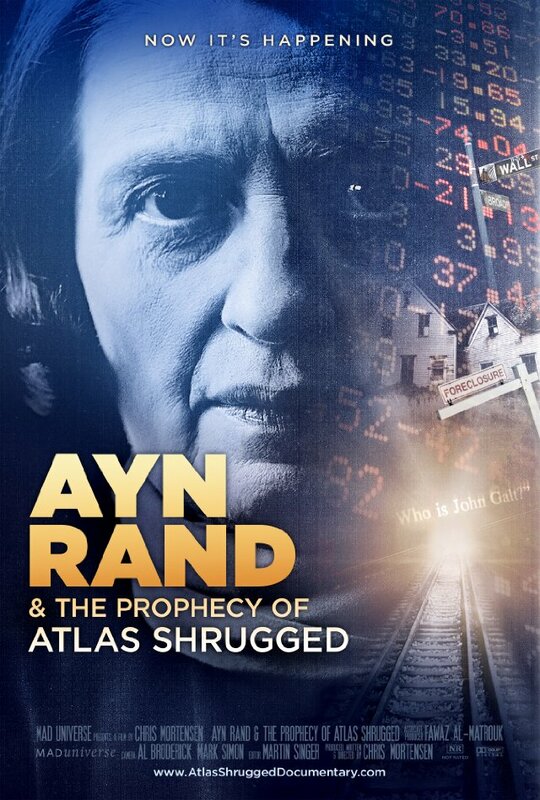 Ayn Rand & the Prophecy of Atlas Shrugged is a feature length documentary film that examines the resurging interest in Ayn Rand’s epic and controversial 1957 novel and the validity of its dire prediction for America. Set in what novelist and philosopher Rand called ‘the day after tomorrow,’ Atlas depicts an America in crisis, brought to her knees by a corrupt establishment of government regulators and businessmen with political pull – the ‘looters’ and the ‘moochers’ – who prey on individual achievement. Less a conventional work of fiction than a philosophical manifesto in the form of a romantic novel, over the course of a thousand-plus pages, Atlas tackles no less an essential argument than the one debated by philosophers and theologians since time immemorial: altruism vs. self-interest. Am I my brother’s keeper – or not? For Ayn Rand, the answer is an emphatic no. To Rand and the disciples of her Objectivist philosophy, self-sacrifice is as heinous an act as murder … murder of the soul. Upon publication, Atlas Shrugged was widely scorned by critics for its ‘preposterous’ plot and one-dimensional characters. Intellectuals and academics from across the ideological spectrum roundly dismissed the new and original philosophy called ‘Objectivism’ that Rand so compellingly illustrated in the novel. Despite this pummeling, Atlas became a best seller and has remained in print ever selling a healthy 75,000 or so copies each year. Then with the new century, sales began to increase dramatically. In 2007, its fiftieth anniversary year, Atlas sold a record 180,000 copies. Since then Atlas Shrugged – published over a half century ago – has sold over a million copies. Why? Because – as evidenced by pointed and frequent references to Rand and Atlas Shrugged in the media – an increasing number of Americans – right or wrong – see their society devolving into a nightmare scenario like the one Rand projected over a half century ago. Ayn Rand & the Prophecy of Atlas Shrugged looks into Rand’s background for the ideas and philosophy that inspired and shaped her novel and seeks to determine whether America is indeed headed for the disastrous outcome she predicted.